The House Majority PAC ad, shared first with The Hill, highlights the fact that Coffman has not yet signed a discharge petition aimed at forcing a vote on a comprehensive immigration reform bill. Democrats see the issue as potent in the district, which is about 20 percent Hispanic, especially against Coffman, who was previously staunchly opposed to immigration reform before shifting early last year. 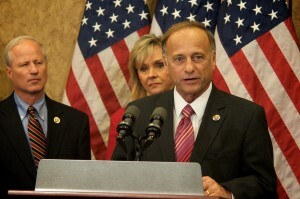 Rep. Steve King (R-IA) with Rep. Mike Coffman (R-CO) left. Congressman Mike Coffman called out a fellow Republican for opposing his proposal to allow undocumented immigrants a pathway to citizenship by serving in the military on Thursday. Coffman, R-Aurora, called out Congressman Steve King, R-Iowa, a noted illegal immigration firebrand who Democrats have tried to sought to portray as a Coffman ally in an appeal to Hispanic voters. “I oppose using the NDAA to push any immigration agenda,” [Rep. Mo] Brooks wrote in the letter asking colleagues to join his effort. “That is why I ask you to sign a letter to House leadership informing them that you oppose using the NDAA to push an immigration agenda of any kind. “If immigration legislation is addressed by the House, it should be done so via the proper process, not by attaching it to must pass legislation,” the letter continues. As you can see, the opposition to this amendment allowing some illegal immigrants who enlist in the military to gain citizenship is made up of a lot more Republicans than Rep. Steve King of Iowa, Congress' foremost anti-immigrant hardliner after Tom Tancredo left the building. The moderate California Republican Coffman is siding with in this dispute, Rep. Denham, is also a co-sponsor of the Democratic comprehensive immigration reform bill (H.R. 15)–which Coffman opposes. With all of this in mind, it's quite clear that Coffman is using this intra-Republican disagreement to manufacture daylight between himself and unsightly erstwhile allies like Rep. King (see photo). The policy change Coffman is making a stink about, a path to citizenship for immigrants who join the military, is really quite narrow. Coffman's vote last year with Rep. King against the President's temporary reprieve granted to "DREAMer" undocumented students would have affected many more people, and stands in stark contrast to the impression Coffman wants this latest spat to leave. That vote was a major stumble for Coffman in his quest to reinvent his conservative image, and we don't see how his support for this much narrower proposal rights that wrong. Especially since Coffman's friend Steve King, and lots of other Republican colleagues, mean to scuttle it. I never noticed that about Mike Coffman's nose before. OMG – I'm not going to be able to 'unsee' that…. Do we really want to be looking at that nose for another two years? Andrew's nose (and everything else as far as I can see) much cuter. Not that I'd let that influence my vote. Just sayin'. Again, if you cared about the issue instead of scoring political points, you would cheer on Coffman and encourage him when he supports you. That fact that you blast him even when he agrees with you makes you shameless hypocrites. The fact that Mikey's being hypocritical in a lame attempt to score points in his newly unsafe district is why he is being subjected to scorn, Modster. But I'm with MB, I need my eye bleach right now, Jeffco. My eyes, my eyes. . .
That would involve trusting him as far as we could throw him. We remember all too well his flip flops on apologizing for questioning Obama's citizenship to apologizing for apologizing for questioning Obama's citizenship to settling for just calling him un-American to kind of walking that back to apologizing if anyone thought he was walking that back, etc. etc. etc. We know he'll say anything. We also know he's often too stupid to know what to say to do himself any good. In short we know he's dishonest and stupid, not exactly qualities we consider praiseworthy. You are blinded by partisan hatred. Fortunately, most Americans are not. I don't think BlueCat is blinded by anything. I think it is rather transparent to all of us that some or our finest R candidates have woken up and realized they just can't win on their same antiquated platforms, so they change what they believe in like changing clothes. Its all good. Nothing more than that really. Have a nice weekend. So you're saying he didn't make those flip flops? Because, as long as he did, it's not hatred to say so, just facty stuff. Know how you guys hate that. Too bad that "most American" doesn't include you Moddy.As far as "agreeing with"us" . Does he actually agree or is he just posturing for the sake of you and other wingers? There's no one in the world knows more about shameless hypocrisy than wingers and their supporters. I don't think Moddy counts the majority of people, who actually disagree with him, as real Americans. Watching Coffman lately is like watching a one-man tennis game. He can't move quite fast enough to play both sides of the net, but he's sure trying. This is one of those political maneuvers that make me ask, "is he stupid or does he think his new constituents are?" I think he hopes people who aren't dyed in the wool, vote red, any red habitual republicans just aren't paying attention. I can't think of any other reason for a campaign as baseless as his.